From The Guardian: Oh l’amour: Paris bridge rail collapses under weight of too much love. 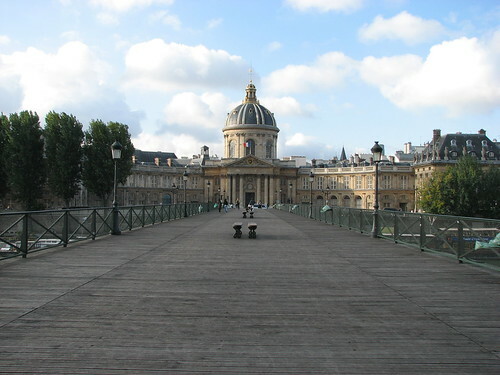 The path of true love for tourists in Paris has often involved a stroll across the Pont des Arts and the attachment of a “love lock” to its railings. The key is then thrown into the river Seine. But the celebrated bridge had to be evacuated at the weekend after part of the railing collapsed under the weight of love locks attached to it. Police ordered visitors to leave and closed the footbridge after a 2.4-metre section of railing broke loose. I did a little Googling after reading this and found all these pictures of how the locks have infested the bridge, like some sort of trendy cancer. It’s awful. It was one of the prettiest things we saw in Paris on our first visit in 2007, just before all this lock silliness started. But hey, why let a beautiful setting like that survive? Better to smother it with rusting, meaningless crap.